Instant Pot Vanilla Bean Yogurt - homemade yogurt has never been easier!! Homemade Vanilla Bean Yogurt using the Instant Pot? Yup, making yogurt from scratch has never been easier. I have had an Instant Pot now since last Christmas and I’ve only really used it for chicken, rice and soup. I figured it’s time I start exploring other recipes I can make with the Instant Pot. When I first thought of the idea of making yogurt in the instant pot, I thought wow, I can make yogurt in an hour that’s amazing! Then I started digging into the research and I need to warn you, it takes longer than an hour. It takes 8 hours alone to make the yogurt, that’s not including the first few steps. So while this recipe is easy, just know it does take 8+ hours of cooking in the instant pot! Yogurt contains probiotics which have proven to be beneficial for our gut health. I think a perk of making this from scratch is the satisfaction of making the yogurt yourself and also – this recipe yields about 7 cups of yogurt – making this a total cost efficient option as well. You can stir the vanilla bean in after the yogurt is made, or before you let it cook for the 8 hours. I think if you strain your yogurt to remove the whey after it cooks – you should add the vanilla after you strain. However, if you don’t want to strain, add it in before. It’s up to you. I personally like a thicker, more creamy yogurt – so I add it afterwards! PIN this Instant Pot Vanilla Bean Yogurt for later! 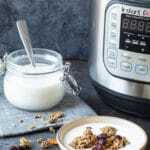 Let’s cover some common questions people have about Instant Pot and Instant Pot yogurt! What is yogurt starter anyways?! To put simply, yogurt starter helps transform your milk into yogurt. It has live bacteria that helps this process along. What’s the best kind of yogurt starter to use? Heavily up for debate if you ask me. I’m sorry I can’t give you a better answer on this one. 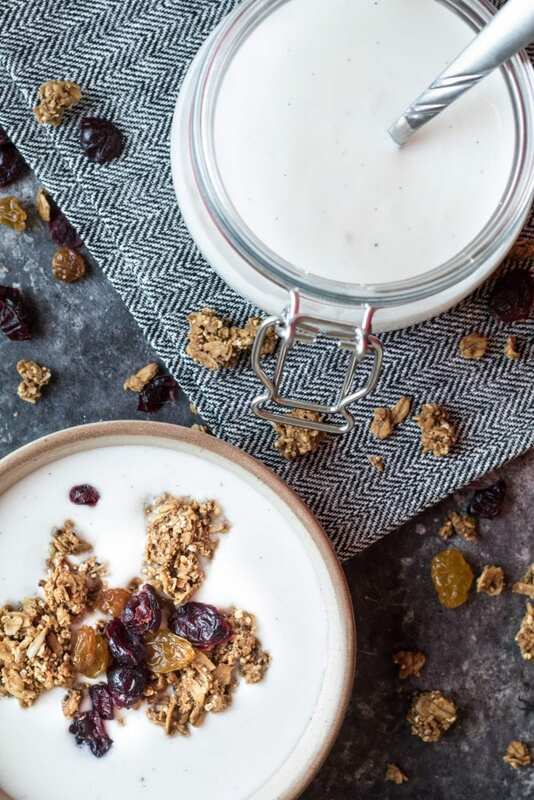 I tried this recipe out using other yogurts for my starter – and the one that turned out best was using Siggi’s yogurt! The bonus is yogurt with active cultures. 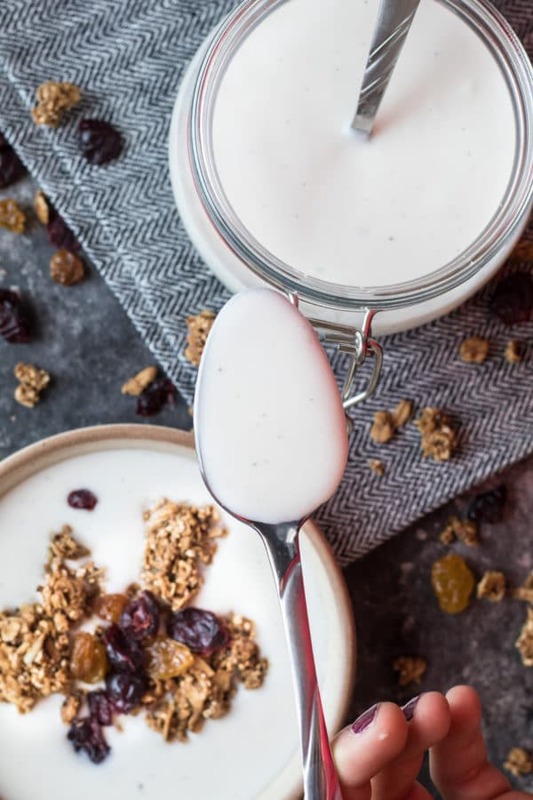 Homemade yogurt is easier than you may think, especially with an Instant Pot! Take out your Instant pot and pour the entire 1/2 gallon of milk into the pot. Lock lid in place and turn the switch to sealed. (Although at this point, it doesn't really matter because we're just heating the milk in this first step). Plug in the instant pot and press yogurt. Click adjust, more and instant pot should read "boil." Let instant pot heat to 185 degrees F - this should take about 30 minutes. Once this step is done, unplug instant pot. Next step is to cool the milk. Take the inner pot out and place in an ice bath until 110 degrees F is reached. Or - if not in big hurry, let it cool to 110 degrees F naturally on its own. You'll want to use a candy thermometer or digital thermometer for this step. Get your starter out (I used Siggi's vanilla bean yogurt) and whisk in 3 Tbsp. starter yogurt. Whisk well. Now, put this back into the instant pot, plug it in, secure lid and set to sealing. Press yogurt - time should read 8 hours, if not - bump it up to 8. Now just let it do its thing! Note: time will count up - so you'll see 0:00 first, don't worry - you're doing it right! After the 8 hours, you can strain your yogurt then stir in the 1 vanilla bean, or just stir it in without straining. It is up to your how creamy/thick you want it. I prefer to strain using a nut milk bag. Cut up then vanilla bean and mix it in well after straining. Then, store in fridge for 6+ hours before enjoying. Happy yogurt making!! Have you tried straining it for greek yogurt? OK I love this! 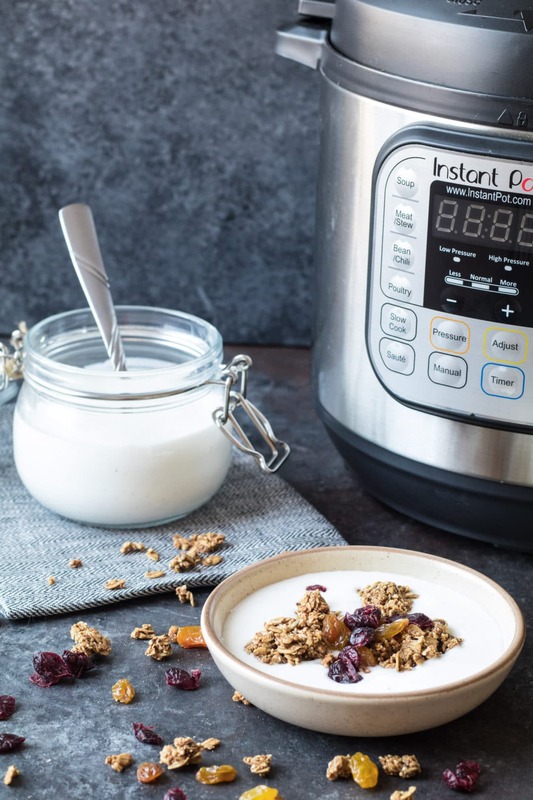 I have always wanted to make homemade yogurt, PLUS I’ve been wanting to get my hands on an Instant Pot! Will have to try this! This really makes me want to buy an Instant Pot but I have NO MORE cabinet space! Have you used nonfat or low-fat milk? No I have not! I would imagine it being less creamy. I think you get more vanilla flavor when you add the vanilla seeds and pod to the milk and heat them together. The flavor gets steeped in the milk better, just like when you make a custard. Then you take out the pod before adding in the starter. Another tip, if you don’t mind slightly more work- keep your milk at 180 degrees for 30 minutes before you begin cooling it down. It denatures the proteins and results in a firmer, creamier French style yogurt. I made this yogurt and it is delicious! Just a note about the recipe – instruction 4 simply states ‘Get your your starter out and whisk in 3 Tbsp. starter yogurt.‘. I hadn’t made yogurt before and looked at others’ recipes as to what a ‘starter’ was/how much of a starter to use. I took out 1 cup of the cooled milk, whisked in the 3 tbsp of active culture yogurt and added it back in. I also added the vanilla bean to the cold milk before heating as suggested by another in the comments. It turned out beautifully. I am so happy you enjoyed it Tracy! Thank you! Tracey thank you so much! I clarified the blog post and recipe to hopefully make this more clear. So happy you enjoyed! You said to cut up the vanilla bean, don’t you just split it open and scrape out the seeds within? Or do you add the cut up pod as well? Just the inside, not the whole bean 🙂 so sorry for not explaining that better – it’s clarified in the recipe notes! Tawnie, this looks really good! I think I need to make these for myself and the kids. Love this idea!